The classic Standard Wingham Carders. The design of the Wingham Handcarders has evolved over the years, culminating in a great piece of equipment that won't break the bank. The backs are made of birch ply, allowing for a small amount of flex, reducing stress on the woodwork. To help with this we don't glue down the card cloth to the base, instead choosing to staple the edges of the cloth to the wood. This means that the cloth can pull and relax with the carding action. The card cloth itself uses stainless steel wire so you can be sure that they won't rust, and our carders should last for many years to come. In general we recommend the Standard Carders for most wools. 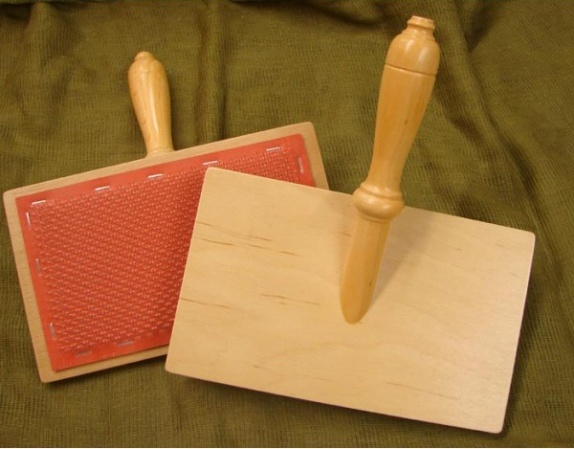 These have the card cloth set at 72 Points Per Inch (PPI): any more and the friction between the 2 carders can make them hard to use. For finer wools and silks we offer the Fine Carders, with the cloth at 108 PPI.